Join the discussion on our forums! Come discuss Ice Breaker over in our dedicated Ice Breaker discussion topic. Frost Elemental Shaman needs a couple more cards and might actually be a viable archetype. Will be nice not having to rely on Jade packages and can focus more on Elemental synergy. Who cares if you face tank a little damage if you run Hot Spring Guardian, Jinyu Waterspeaker, and Kalimos, Primal Lord, maybe even a home for Tidal Surge. This is like a reusable Shatter. Not good. Please replace these components if use causes fatal damage: HEAT SINK. MAGAZINE. OPERATOR. Stealing jokes and mechanics! A battle tested design, it's pretty fun in Eternal so I hope the Hearthstoners like it too. Freeze Shock is good now gu-*cough cough* Just...*hack* Just give me a moment... *barf*... Sorry, I was choking on my own sarcasm. 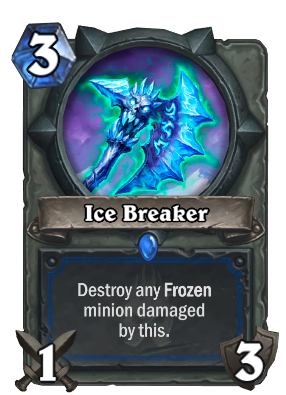 Freeze Lance + Shatter never saw play, Hex costs the same amount of mana as this weapon does etc. etc. Moving on. With the reveal of Voodoo Hexxer, this card might not be terrible if we get more freeze stuff revealed. Maybe a slow grinder shaman? Agreed, freeze isn't yet a thing for Shaman. It really should be, they should have given the effect of the KFT Trollo Legendary to an epic card, and made some sort of Thrall Deathseer synergy with the Legendary. This should NOT be the only activator in the deck. Now that even Jade Claws* (edit:whoops typo) was removed and Spell Claws nerfed: RIP OP Shaman, 2015-2017. "So it is Shatter in weapon form. Shatter did not see any play so I don't think this card could see any play either. Mage has soooooo many strong spells to deal with minions, so this weapon is kinda unnecessary right now." I thought it is a mage weapon but even though it is a shaman weapon it is still crap. Shatter doesn't have the potential to kill 3 minions, this does. Ice Shaman isn't there yet, but this is definitely a good card if it gets more support. Freeze/Ice shaman was halfbaked, they are afraid of making another Ice Lance or even making Shaman halfway decent again... You can tell, because Ice Shock is an basic card which goes golden early (so Team 5 thought it would never see play) and those are usually crap cards (exception: Shadow Visions + Mind Blast, but then again Discover is OP af).